I really do love The Fast and the Furious. The original movie, with all of it’s flaws, is a clear derivation from the equally ridiculous Point Break, and all of the challenges that came with telling a story about a cop gone native. The story was simple – Brian, as played by the late Paul Walker, was an undercover cop investigating street racers in hopes of uncovering a group of thieves that committed larceny using their cars. Dom, played by Vin Diesel, was the head of one of these gangs, and because of their mutual love of street racing, and Brian’s interest in Dom’s sister Mia, a friendship was born. One of the things that haters of these kinds of movies seem to forget is that all films are stories. Some of us just happen to prefer certain story themes over others. But all good stories function well at both exaggerating and limiting elements of a tale in hopes of constructing a narrative that affects you on a personal level. I stand by the statement that these are good films. The original The Fast and the Furious spoke to me not only because of the chemistry between it’s two male leads, but because of how the cinematography was handled, as not once did any shot remain static. Additionally, the attention to crafting relationships with dialogue, as well as the semi-plausibility of it all were essential – I could imagine an undercover cop falling in love with the sister of a suspect, and becoming friends with that suspect and his crew because the cop related to them at some level. Each of the subsequent films worked to build on this formula of bonding and added in details to flesh out the stories of Brian O’Connor and Dominic Toretto. Turning them from friends into brothers. This is where the mention of “family” in parodies later becomes brutally apparent. That said, family is what has made these films interesting, the glue that binds them together. 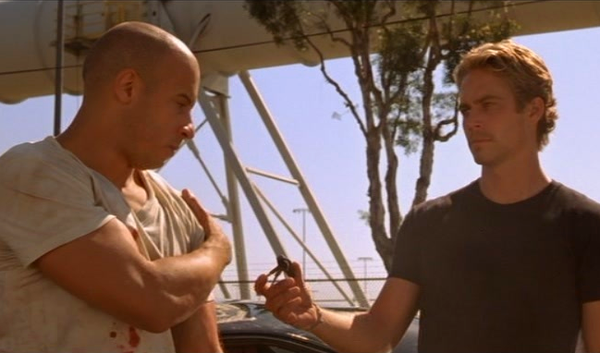 Brian gave Dom a 10 second car at the last minute of The Fast and the Furious out of respect and love, but also because another of his best friends, Roman Pearce, was a criminal that he couldn’t/wouldn’t help. In 2 Fast 2 Furious we learned more about Brian’s past, which helped us better appreciate the first film. Throughout the series Brian realized that family beats out everything, and it became the backbone of his purpose in the stories. Dom served as the father figure that would bring everyone together, and would fight for his loved ones at all costs. As the franchise evolved, the action sequences and set up for each story became more elaborate, partly because of fan expectations, but also because of a theory I have which demonstrates the heroic nature of the protagonists. They could achieve the impossible, but most importantly, they were at the core, a group of misfits bound by love. They started out as street racers, but were really superheroes underneath it all. This is why when Paul Walker died mid-production of Furious 7, I had hidden reservations about the future of the franchise. But when the first trailer for The Fate of the Furious came out, I was still stoked. Charlize Theron was cast, and I heard rumours that Helen Mirren was a last minute addition. I even did a Facebook live post while I watched the trailer. And as time went on, I enjoyed each of the subsequent trailers that cropped up. Maybe they had found a way to move on without Paul Walker. After all, the series had managed to progress from robbery and street racing, to drug dealers, to heists, to fighting against international terrorism, why would this film be any different? Without going into great detail about the plot of this film, I’ll start by saying that I was glad to go see it, and director F. Gary Gray has done the series justice in terms of cinematography and action sequences, on top of that we get to see the most dramatic portrayal of Dominic Toretto to date. But it doesn’t have quite that same balance without the glue that is Brian O’Connor. Luke Hobbs, played by Dwayne Johnson, is way too big of a star to properly co-share the screen time with Dom, and adding in former villain Deckard Shaw (Jason Statham), just feels dirty and wrong. Lest we forget that Deckard killed Han and several military types en masse as revenge for what happened to his brother Owen. Deckard then becomes a sort of goofy trigger-happy member of the team in the last act, which, while entertaining, drove me completely nuts. Why couldn’t one of the other members of the team seen more screen-time, like Roman, Tej or Letty? Heck, I’d even have been happier to see more Ramsey, but less Ramsey as object of competition between Roman and Tej. In brief, F8 loses some of the charm and brotherhood that made The Fast and the Furious feel like home to me, though to be clear, Dom never really does turn his back on family, in fact, the twist is too good. It perfectly fits with his character. But, if this is a set up for what ends up being a satisfying trilogy conclusion to the Fast franchise post Paul Walker, I hope it’s all worth it. It could just be a theory, but maybe Scott Eastwood could replace Paul as the new guy with good hair?